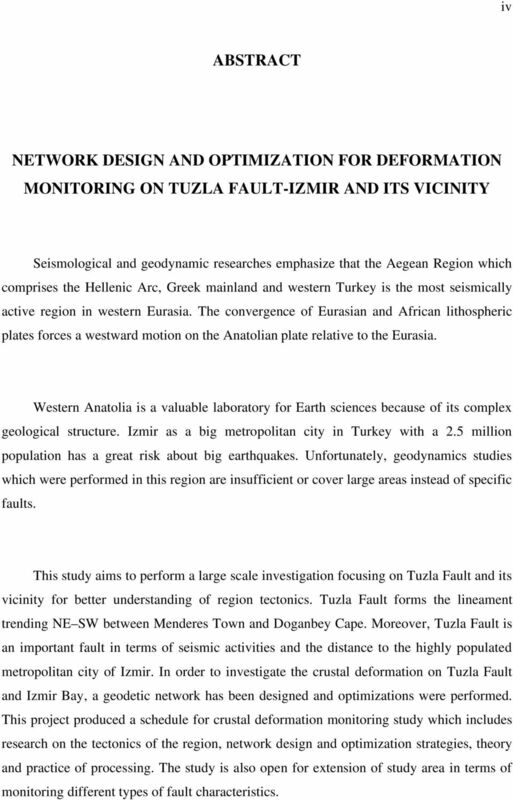 Download "NETWORK DESIGN AND OPTIMIZATION FOR DEFORMATION MONITORING ON TUZLA FAULT-IZMIR AND ITS VICINITY"
3 iv ABSTRACT NETWORK DESIGN AND OPTIMIZATION FOR DEFORMATION MONITORING ON TUZLA FAULT-IZMIR AND ITS VICINITY Seismological and geodynamic researches emphasize that the Aegean Region which comprises the Hellenic Arc, Greek mainland and western Turkey is the most seismically active region in western Eurasia. The convergence of Eurasian and African lithospheric plates forces a westward motion on the Anatolian plate relative to the Eurasia. Western Anatolia is a valuable laboratory for Earth sciences because of its complex geological structure. 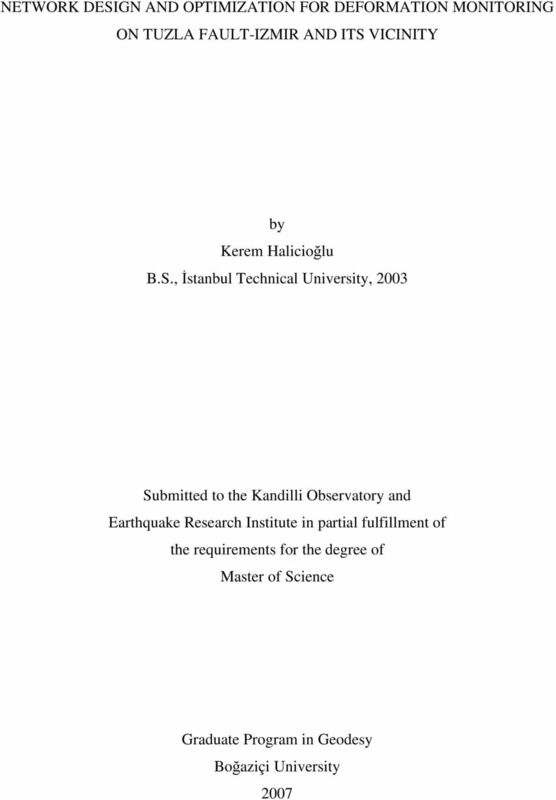 Izmir as a big metropolitan city in Turkey with a 2.5 million population has a great risk about big earthquakes. Unfortunately, geodynamics studies which were performed in this region are insufficient or cover large areas instead of specific faults. This study aims to perform a large scale investigation focusing on Tuzla Fault and its vicinity for better understanding of region tectonics. Tuzla Fault forms the lineament trending NE SW between Menderes Town and Doganbey Cape. Moreover, Tuzla Fault is an important fault in terms of seismic activities and the distance to the highly populated metropolitan city of Izmir. 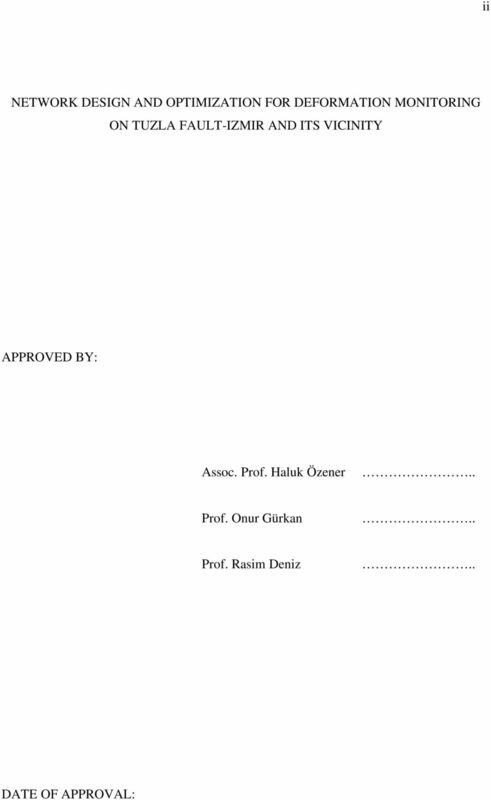 In order to investigate the crustal deformation on Tuzla Fault and Izmir Bay, a geodetic network has been designed and optimizations were performed. This project produced a schedule for crustal deformation monitoring study which includes research on the tectonics of the region, network design and optimization strategies, theory and practice of processing. The study is also open for extension of study area in terms of monitoring different types of fault characteristics. 5 vi çalı mada yer vermi tir. Bunun yanında, çalı manın gerçekle tirilece i bölgede, uluslararası bilimsel platformda kabul görmü kabuk deformasyonlarını belirleme amaçlı jeodezik a ların tasarımı üzerine gerçekle tirilen çalı malar bölgede tesis edilen jeodezik a a uyarlanmı tır. Çalı ma bu jeodezik a yolu ile gerçekle tirilecek ölçme çalı maları için de bir veri hazırlama ve de erlendirme adımlarında önerilerde bulunmu tur. Sonuç olarak bu çalı ma, kabuk deformasyonları belirlenmesi amaçlı jeodezik bir çalı ma için bölge seçiminden veri de erlendirme stratejilerine de in bir dizi önerilerde ve açıklamalarda bulunmaktadır.